In a city known for its racially segregated communities, residents in a neighborhood in Chicago’s Hermosa community on the Northwest Side are pushing for integration for personal reasons, according to a note scrawled on a sign. 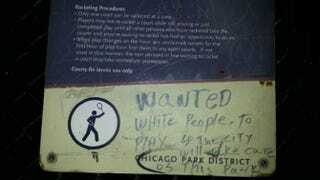 “Wanted white people to play so the city will take care of this park,” the sign reads, according to CBS Chicago. Hermosa, a predominantly Hispanic community, means beautiful in Spanish. But the scrawled note suggests that the community’s name does not apply to the 8.5-acre park, intimating that it is rundown and untidy. The news station reports, however, that the park has the typical amenities of a Chicago Park District facility, including a field house, fitness center, tennis courts, walking paths, and baseball and soccer fields. The comment reignited a long-running debate about the benefits of integration and gentrification in major cities. In a post at Chicago Reddit , where the image was first spotted, commenters agreed and disagreed with the writer’s plea for more whites. Some do not believe the community will ever be gentrified, saying it’s too far from public transportation. “Yeah come back in a decade and it will be WHITE PEOPLE GET OUT THE RENT'S OUT OF CONTROL,” another commenter wrote.